Choose from a series of vine supports to create a great looking retail product. 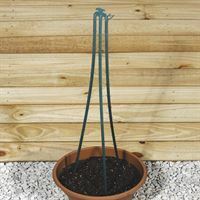 A simple, easy-to-use plastic trellis with grips on the legs that will not pull out after the plant is fully rooted. This is the perfect choice for any vine or climber including indoor foliage plants. 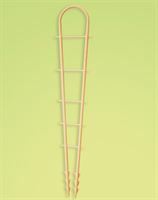 Trellis stands 25" tall allowing easy shipping in boxes or in racks. 50 per box. 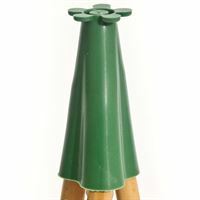 These soft, rubber caps hold three bamboo stakes firmly in place to form a perfect pyramid trellis. The cap holes are tapered to accept and securely hold varying thicknesses of bamboo stakes up to 6' tall. Sold in boxes of 1,000. The easy way to grow and display vines. Three legs are designed into one piece. Made of durable, weatherproof plastic, each leg has stairs for vines to grasp and grow upon.